[HIGH CAPACITY POWER BANK] Rugged high capacity 10200mAh power bank (2.1A Power Output) is a perfect portable charger for smartphones, tablets and portable electronic devices. [TOUGH, STURDY, AND RUGGED] The FosPower battery pack is designed to be snow proof, dirt proof, drop proof and water proof. Great mobile battery back up for catastrophic event like hurricane, tropical storms, flood, earthquake, tornadoes etc. [SAFE AND MULTIFUNCTIONAL] The power bank has built-in short-circuit, over-charge, and over-heat protection. The portable charger also comes with LED flashlight, compass, and a Carabiner. [IP67 CERTIFIED PROTECTION] The external battery charger is certified to be dust and water resistance for up to 3ft/1m for 30 minutes under water. [LIMITED LIFETIME WARRANTY] This product comes with a limited lifetime warranty. Please refer to FosPower’s website for more information. "The Best Gear for the Beach This Summer"
by Conde Nast Read More "Best summer accessories for iPhone and other Apple devices"
by iDownloadBlog Read More "Father’s Day Gift Guide: Must-Have Tech Gifts"
by Parenting In Progress Read More "The 10 Best Portable Chargers Under $100 On Amazon"
by Oracle Read More "5 Best Portable Battery Charger in 2018 for Your Android Phone"
by TheDroidGuy Read More "Top 10 Best Rugged External Battery Chargers..."
by Colour My Learning Read More "Best Rugged and Waterproof Power Banks"
FosPower PowerActive portable external battery charger is designed to withstand drops, dirt, snow and even water. The battery pack is made from durable polycarbonate (PC) and ABS material. With 10200mAh capacity and 5V/2.1A output, the PowerActive battery pack is able to charge your iPhones, iPads, Android phones, tablets, mp3 players, controllers, switches, headphones, and more. The rechargeable lithium-ion battery supports more than 500 charge cycles during the course of its life. The compass comes in handy if you ever get lost. It also has a built-in LED flashlight that guides you in the dark. This phone charger is compact and portable, measuring at 1.05 thin and weighing at 7.76oz. 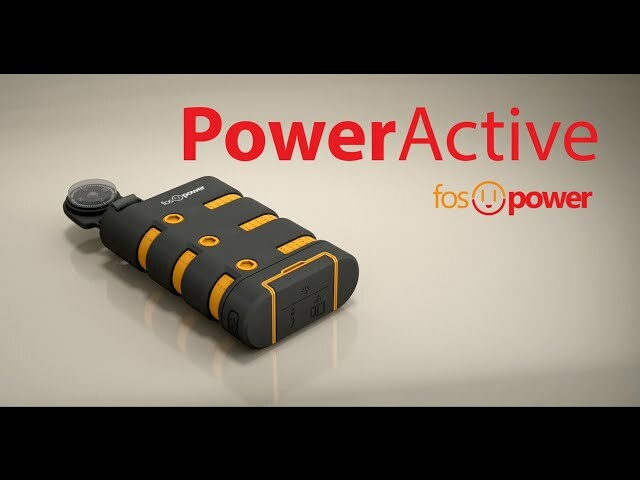 FosPower PowerActive is tested using international standards for dust and water protection. With all the ports tightly sealed, it is capable to be immersed in the water up to 3ft/1m for 30 minutes (but don't try swimming with it). We have served millions of customers for more than 10 years and every product comes with a limited lifetime warranty. Got a question? Reach out to our experienced and dedicated USA based customer support 24 hours a day, 7 days a week. Please refer to FosPower’s website for more information. I took this on two trips and it worked fine. On returning home, I find the flashlight is on and cannot be turned off. A constant drain on the battery rendering the device useless.